Having been inspired by threads here I'm thinking of getting the Winter Holiday Train but want to power it. There are sets on ebay with the battery box, power unit, control and receiver but would I need different axles too? Thanks for any help I'm very new to all this . You want #8879, #8884, #88000 and #88002. You don't need anything else. You can buy them individually, as a set or try to pick up a bargain used or new earlier train set with them included such as #60051. The instructions for the Winter Holiday Train include how to motorise with the components listed above. As described above, the steps to motorize, along with the needed parts, are all listed in the instructions for the set. I ended up buying the components separately off Shop @ Home. 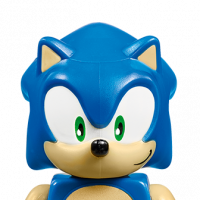 However, you may have luck on Bricklink or even Facebook Marketplace/Ebay. You could also explore other trains that already come with those parts. That was recommended to me once upon a time. You may be able to find #60197 Passenger Train on a sale somewhere. You get all the power function parts and an additional set to build/display. Thanks a lot for your help guys really appreciate it. I'd like to do this so will search for the needed bits and hopefully get it going for this Christmas. 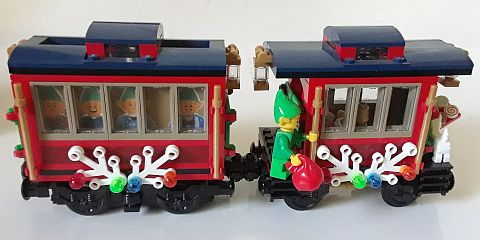 There is a set on ebay for £40 which seems a good price even if it is used. Has anyone made any modifications to create more space to the train after adding the power functions? ^There are several modifications out there that people have posted. You can check out the Winter Village thread and search through previous posts. The typical modification is to put the battery and receiving both in an expanded tender car. This frees up space in the engine and doesn't have the wires running between them. Other's have either used spare/bought new parts to have longer cars behind it. Or some opt for two sets and then pretty much double everything (or at least select things). It's fairly simple to add carriages etc to the train, especially if you have purchased another different set to get the parts needed to motorise. 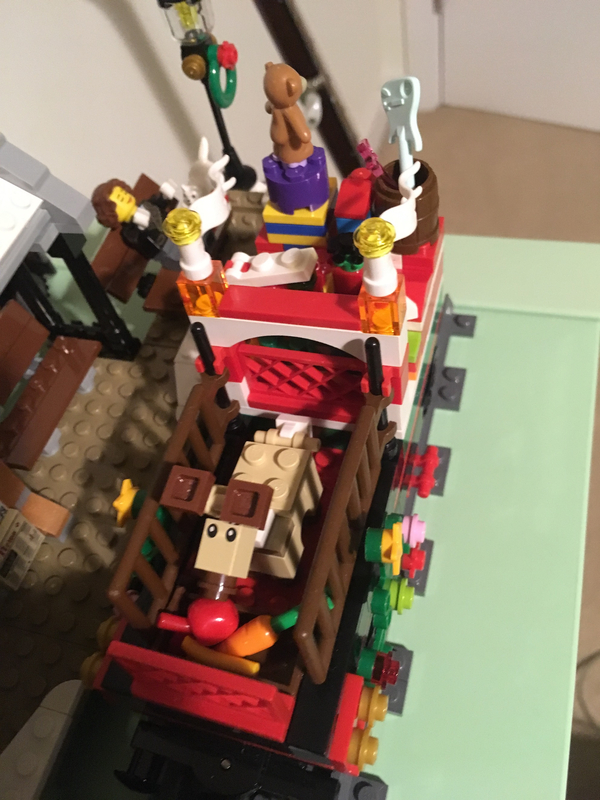 I'm far from an expert, but it was easy enough to extend the tender to hide all the electronics, alter the wagon with the tree and create an additional baby reindeer/present wagon. Loads of inspiration around, especially the mouseketeer ones referred to above. Some great ideas , thanks a lot. As I'm new to lego I don't have any spare bits etc yet , I'm sure I will eventually, but I've got the train set and winter village station on the way and the set to make it motorized . My first buildings , I've only done 1 technics kit so far but have another one of them coming too. My plan is too extend the Christmas theme more later but think this should be a good start. I'm sure the train will be longer next year. 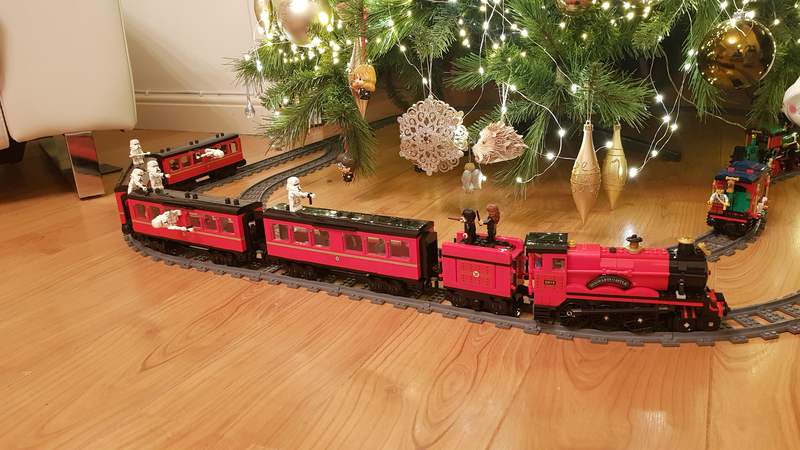 I'd like to consider putting one of these under the tree attached to #10259, does anyone know if extra track may be required, or have any measurements on the diameter of the circular track that comes with the set? *only running the Winter Train this year, not using #10259 Station. I made an extra cart and shoved everything in there; motor, battery box, receiver. I like it better this way, as I don't like the modified engine and the wires running through to the tender. I also recently bought #10254 and have been debating if I want to spend the $60 or so to motorize it. My wife and I are setting up a dedicated table for #10254 and #10259, and probably laying down some quilt padding to replicate snow. We will probably be purchasing a track pack to get 4 additional straight tracks to make an oval. If we do choose to motorize it, chances are it would just be the standard way this year (and at that point we'd just go all in and also get #10263 to put on the table as well) and I'd work on creating a better way to hide the electronics next year. For those that have motorized the set and expanded the tender, was the expanded tender built off the train motor and the battery box and receiver installed on that car, so that the motor is actually pushing and pulling as opposed to just pulling, or did you run wires from the engine to the battery box in the tender? This is exactly my plan . I've got the power functions coming too. Hopefully next year I will add another carriage and lights using the extra carriage for the battery packs etc. The power goes through the rails to the engine. Can I just swap out the engine base on a modern train like this and use my track or are the two systems not compatible? ^I'm not very deep into the train world, but based on what I've seen and read, yes. All track widths should be compatible. So long as the motor used draws its power from the rails like in the 9V systems, you're good to go! @shikadi ; You absolutely can! You just have to make sure the center pin on the 9V motor can mount into a blind spot or Technic hole. This sounds a better system if it runs from the main s via a transformer or its it still battery powered? There's a controller that connects to the track and can change speed / off and on, that runs on batteries or can be plugged into the wall. Thanks @shikadi. May look into this in the new year as an alternative method. ^ In my opinion it's a better system but parts are getting more and more expensive. The rails are metal top pieces and it is powered by a transformer. If you don't have 9v to begin with, I would strongly recommend NOT going down that path now. The track is expensive on the aftermarket, as are the other components which have been out of production for quite some time. I've found it increasingly more difficult to keep my 9v stuff in top shape and I've been working to eliminate it altogether. @daewoo Thanks for the warning. I've had a look around and think your right. Share because a mains powered set would be so much better. I finally got my Holiday Train and Station built and got it set up around the tree. As only my second build I'm really pleased but can see why so many get Mods done. 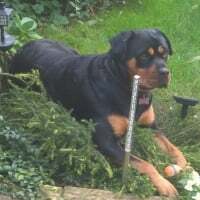 So a couple of questions if anybody can help. As a new guy I don't have any extra bricks etc, I've seen bundles of 1kg on ebay , would this be a good way to start for playing around at any Mods? 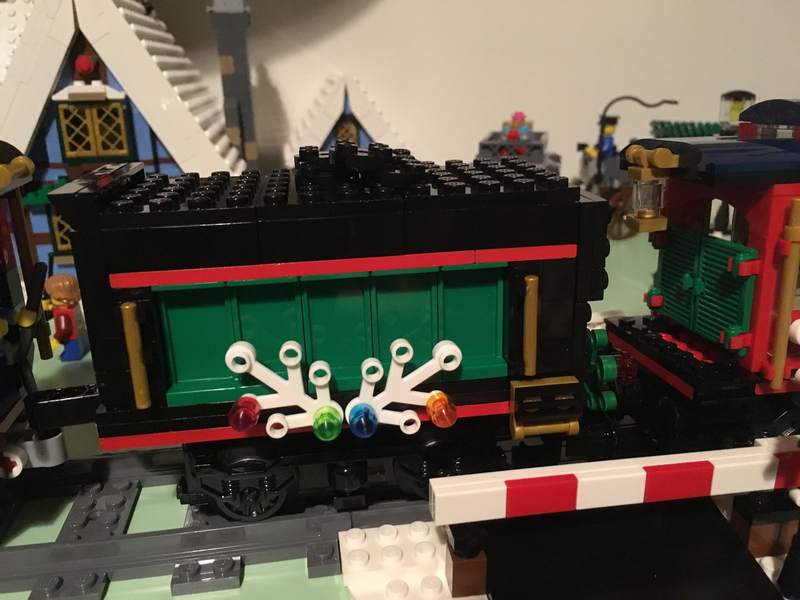 I'd like to add lights to my Train etc as its a bit dark under the tree but have been reading about lego lights and got totally confused. Any suggestions on the best way to go about this ? I’d suggest you google image search for modifications that other people have tried and pick out details you like. Look closely at pieces you need and try to work out how modifications were achieved. Then go on BrickLink to order those parts. I was up way too late last night doing just that for my own Christmas project. 5mins on BrickLink in real time is a couple of hours. A cheap few parts turns into a long expensive list. But your modifications will be great! Before I answer and as you are fairly new to the hobby I will post the disclaimer that the info you are about to receive can lead to a very deep and expensive rabbit hole. For bricks to do modifications to builds, because you will probably want parts that are specific to what you want to build, I personally wouldn't buy bulk lots off ebay as you may get some of what you want but will more than likely get numerous parts that are not suitable. There are 4 main (online) places to buy parts of your choosing. Bigger selection of the currently produced bricks - can also work out expensive on parts although for tiles and larger Technic bricks it can be cheaper than the two sites listed below. (Unfortunately Bricks and Pieces is shut for the Christmas period, happens every year and usually opens again February time). If it's been made in Lego, it can usually be found on this site - price per brick can be a lot cheaper than buying from Lego themselves but shipping and handling can work out expensive if you place lots of small orders (my best advice would be read any thread on this forum concerning Bricklink and spend a bit of time getting used to the site i.e. wishlists, auto buying and the differences in splash pages for shipping T & C's). Brickowl has much the same concept as Bricklink (wishlists, auto buying etc) but can be easier to negotiate for newbie's to brick buying - There isn't the vast level of items available that there are on Bricklink but should be adequate for your needs starting out. Shipping is normally calculated at the buying stage (no waiting for invoices for shipping/handling to be calculated by the seller) and the parts are easier to search for from the category listing if your not sure about exact part numbers. The rule of thumb for the last two sites is get as many of the parts you require from a single source as the biggest killer to price per part can be the shipping and handling. Also do some research on the parts your buying, the cheapest part price doesn't always mean the cheapest by the time it's been delivered to you. 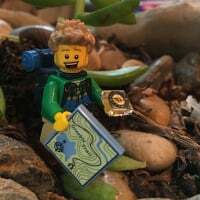 As for the lighting of Lego displays, I recommend doing a Google search of 'Lego Lighting systems' and having a read through the various websites available as there are numerous systems out there and it will all depend on whether you are looking for set specific systems or do it yourself systems. Ditto on the bulk off eBay - you might get a lot of parts but more than likely you won't get exactly what you need. You're better off determining which specific parts you need and just ordering those from the sites listed by bandit778. If you're not sure what you need, then you can try Stud.io or Lego Digital Designer which allow you to construct virtually and then you can order specific parts once you're satisfied with your design. Thanks for your advice , glad I asked now. I've got an idea of making the engine bigger . I will take a look at the virtual design stuff whilst I'm off work over Christmas and hopefully get an idea of what i need. I'm thinking of using some little lights I found on a few sites and doing my own lighting but will see how it goes. I'm sure there will be other questions but eventually I should have something to show you all . Or you could buy a second Winter Train set, as that might have the right sort of parts you like. One thing worth noting regarding bulk lots on eBay is that sellers tend to vastly overestimate the worth of their lots. While they are usually good value for money, the randomness of the content makes them not particularly useful. I'd recommend keeping your eyes and ears open for local garage sales that might have Lego or friends that have some they don't use. I added a second passenger carriage to my train - it wasn’t cheap. 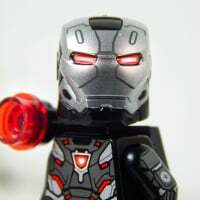 I used BrickLink to order the parts but I think it was still around £16. But I’d second buying a second set! @Kev80e if you were to use eBay, I’d look for a second-hand version of the whole set. Even cheaper if it was sold as incomplete (if you’re looking to ‘vulture’ certain parts from it). Unfortunately, modifying the winter train so close to Christmas will be expensive! Some of you may have seen my version of Santa’s workshop in another thread. To get the parts for this I bought three copies of #10245 but I picked one up (incomplete) straight after Xmas when most people were putting their Xmas decorations in the loft and another in the summer (again, sold as incomplete) for a ridiculously low price. But go for it - it’ll look amazing, I’m sure! You could also check out Mouseketeer’s larger version, looks really good and packs all the stuff you need to make it go by itself. I'd recommend a second set too and also advise against the bulk lots from the likes of Ebay, at least at this stage. Chances of them including what you need in good condition are very slim. The set was reduced to just over £40 last January from Lego directly and for around £38 a few weeks back from John Lewis. 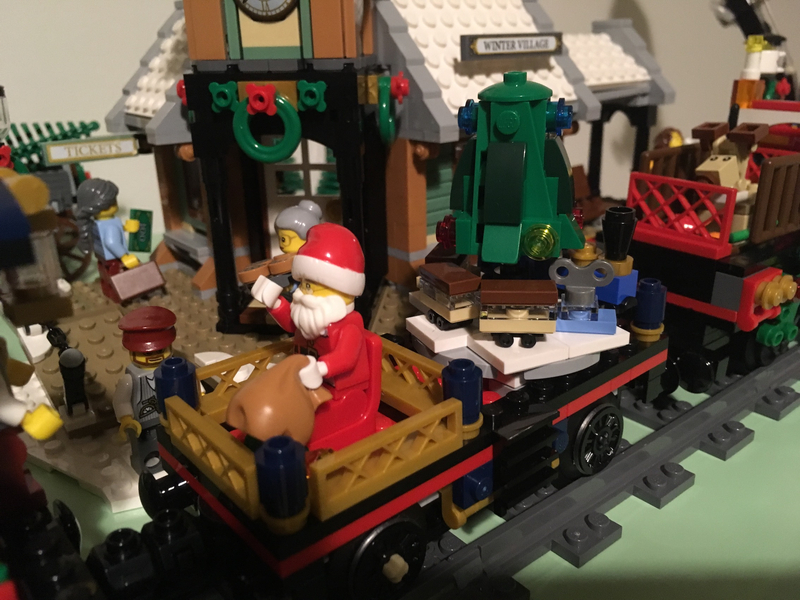 If you aren't in any particular hurry to extend it for this year, that's definitely your best bet as you couldn't Bricklink it for that sort of price. Two sets will give you everything you need to make the engine bigger, extend the tender for the electrics and add additional coaches and trucks. The Mouseketeer options are also excellent, but I'd start with the additional set when it's on sale again. Thanks guys. It seems the bulk buys on ebay are out. I will keep an eye on the prices for a second set , I'm not planning on trying to do it this year , I think this will be the best way to go. For lighting I'm thinking fibre optic might work but will experiment whilst I try to mod the set. Thanks again for all the advice , everyone here has been really helpful. I bought TLR train when it was highly discounted, and modified it. i bought the passenger train when it was highly discounted for the remote and power functions. Between these two buys, the winter train and stealing the old Hogwarts Express passenger vehicle and then extra pieces from here. , I now have two different winter trains, with one of them motorized. I got the bug and decided to order some lights from lightup blocks but the order has said pending for 2 days now and no answer to my message and email, does anybody have any experience buying from here? 9v controllers aren't that rare (I see them on ebay), and the transformer by no means has to be original (anything equivalent will work). They use plenty of that stuff in the GBC community (maybe that's where it's all going). You could also substitute any other variable voltage power supply that goes up to 9V (with enough current) including replicating the simple circuit inside the Lego controller. Can somebody clarify the difference between Power Functions and Powered Up? It was mentioned above that you can motorise #10254 with either #60051 (which contains the four parts mentioned in the instructions for #10254), or with #60197 - which is Powered Up according to the box. @benbacardi, haven't used powered up at all but from what little I've read essentially it boils down to Powered Up is Blue Tooth enabled and Power Functions isn't. What that would enable you to do function wise I haven't got a clue (presumable App enabled or programmable to an extent?). @benbacardi To motorize the train, I'd recommend Power Functions #88000, #88002, #8884, and #8879. All in stock at Lego.com this morning. The Powered Up battery box appears to have a blue-tooth receiver built in, but I don't see it listed for sale as a separate part. It looks like the connectors are incompatible between Power Functions and Powered Up. Can somebody clarify the difference between Power Functions and Powered Up? As someone mentioned earlier, the two systems are incompatible. The big difference between the two is that because Powered Up is Bluetooth (v infrared for Power Functions), it has one less part you need to hide away in the train. For power functions you need the battery box, the motor for the wheels plus a separate infrared receiver. You don't need the infrared receiver with Powered up which makes life a lot more simple. So that's one less bulky item and one less wire to hide. I was trying to motorise a Hogwarts Express a few weeks ago. I started off trying to cram all the Power Function parts from #60051 into a passenger carriage. In the end I just gave up and instead put the two Powered Up elements from #60197 into the coal cart and it make life so much more simple. The other thing to remember with Power functions is that you really need to have the infrared part protruding from the train as it works much more by line of sight. Here's my completed Hogwarts if interested. Having everything in the coal cart also looks nice as originally you could see all the Power Functions through the windows of the passenger carriage. I like your Range Troopers! I imagine Han and the rest of the crew using their AT-Hauler to pick up one of the passenger cars with Ron and Harry inside, looking scared, and Han saying, "Beckett said it's a train job! ...What do you mean, "wrong train?" @Brainslugged ;Thanks for the reply! If the train was designed to be motorised with Power Functions, having an extra bit to "hide" shouldn't be a problem, right? The instructions should tell you where to put it? @datsunrobbie Thanks, that's what I read above - and they may all be in stock at [email protected] in the US, but not in the UK ;-) the motor is "out of stock" and the battery box is "shipping by Jan 22nd". How well does the IR remote work as the train goes behind the tree, for example? @benbacardi, my train currently goes into a tunnel and seems to have no issues with maintaining control and function when it's out of sight. This includes adjusting speed and direction. I can't imagine that signal issues would be a concern behind a tree? I've had no problems with the IR remote when the train is behind the tree, but I don't have much set up around the tree. It will need line of sight, so if it disappears behind a stack of presents or a building it won't work until line-of-sight is restored. Bluetooth connection for Boost and Mindstorms works nicely, but seems to me to be a bit of overkill for trains, which really only need a speed control for a motor. The IR is line of sight so it will not work if you don't have that.